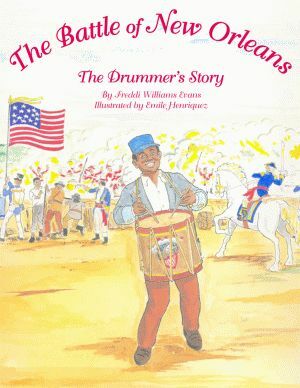 The Battle of New Orleans: The Drummer’s Story explains the important role that a drummer played during wartime. Beating his drum over the din of battle, his rhythms served to inspire and unify the soldiers. This perspective of what some might consider a minor role makes this picture book a unique testament to wartime heroes of all kinds. A glossary of terms is included in the back of the book, defining words like “artillery,” “reveille,” and “Congo Square,” a public square in New Orleans where African slaves and free people of color gathered on Sunday afternoons to play musical instruments, sing, and dance. 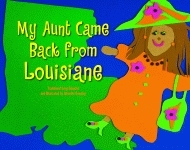 Author Freddi Williams Evans is an artist/facilitator with the Jefferson Parish Public School System in Harvey, Louisiana. She holds a bachelor’s degree in music and psychology and a master’s degree in creative arts therapy. Originally from Tougaloo, Mississippi, she now lives in New Orleans. In 2004 she received the Special Book Award (Juvenile Literature) from the Mississippi Library Association for her book A Bus of Our Own. Illustrator Emile Henriquez was born in New Orleans in 1937. Widely known as a commercial artist, graphic designer, and calligrapher, he has illustrated three other books for Pelican: D.J. and the Zulu Parade, D.J. and the Jazz Fest, and D.J. and the Debutante Ball. He lives in Slidell, Louisiana. Click here for the Front Matter. Click here for the Battle of New Orleans study guide.